Healthy Inside ~ Fresh Outside..!! 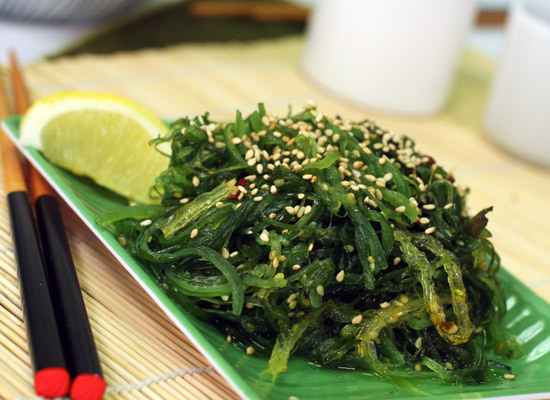 : Seaweeds, The Popular Sea Veggie ! The chemical composition of seaweeds is so close to human blood plasma, that they are excellent at regulating and purifying our blood. They can contain up to 10 times more calcium than milk and 8 times as much as beef. They help to alkalize our blood, neutralizing the over-acidic effects of our modern diet. They offer protection from a wide array of environmental toxins, including heavy metals, pollutants and radiation by-products, by converting them to harmless salts that the body can eliminate easily. Seaweeds contain lignans (naturally occurring chemical compounds) which have anti cancer properties. They are rich in chlorophyll (the pigment that makes some seaweeds green) which is a powerful, natural detoxifier that helps to draw out waste products. Seaweeds play a role in boosting weight loss and deterring cellulite build-up. Their naturally high concentration of iodine, helps to stimulate the thyroid gland, which is responsible for maintaining a healthy metabolism. At the same time, its' minerals act like electrolytes to break the chemical bonds that seal the fat cells, allowing trapped wastes to escape.